With less milage in front of me today than previous days I got started on the road closer to 9am. I even stopped in the road at McDonalds to take advantage of AT&T WIFI to do some social media communication. I also stopped at a rest area in AZ close to the NM boarder to make a sandwich for lunch. It was nice to have the time to do these things. The senery has changed too. 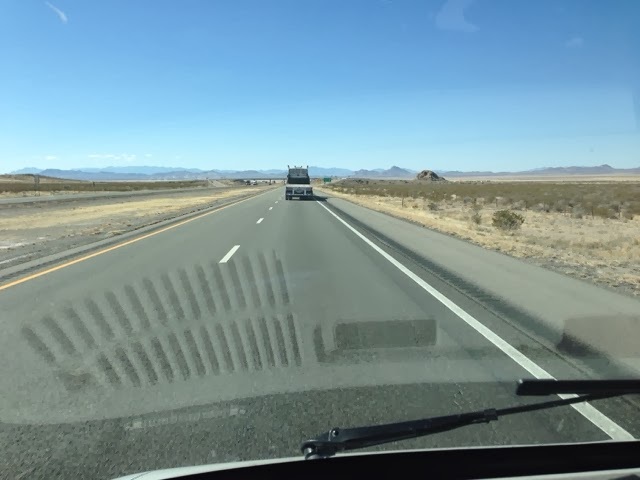 Here is what I10 looks like during my ride today. I have been having regrets about how little time I have to do things I like, but extra effort to get out of the southeast and Texas paid off not being in the freezing weather. 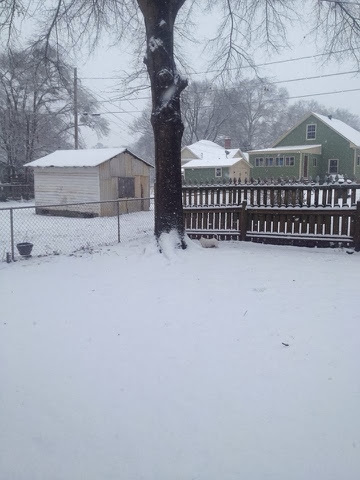 Here is a picture of the snow in Cartersville, GA that my cousin Ramona took, where just a few days ago I was parked. 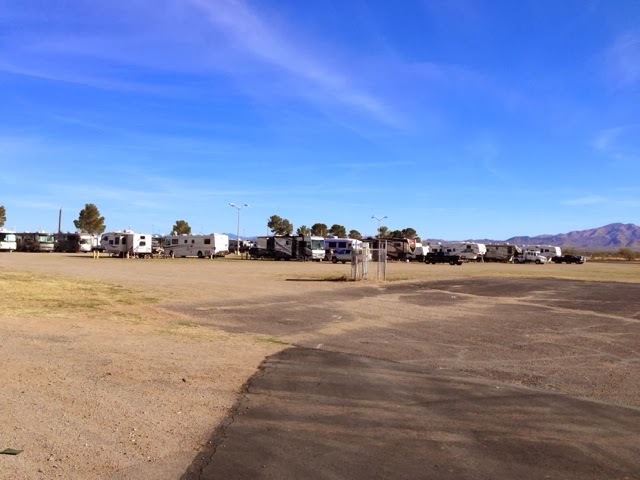 I arrived in Tucson mid afternoon and decided to take Ross from Alberta's suggestion to stay at the Tucson fairgrounds. It costs $20 per night for hookups and $10 with none. I decided on hookups as the price is right. It's funny how things turn out. The site the woman brought me to had a Dish truck parked in it so she gave me another site. After settling in and making a grilled chicken salad I went for a walk and found a great spot for WIFI and sat on a rock to download some files when a woman and her husband come up walking their 4 small dogs. After some small talk about where I was from the woman Shannon says "Westminster, we used to live there!" Shannon & her husband Jeep rented a house on South Ashburnham Road for a number of years and we have some common friends. They since retired. Go figure they were in the site next to mine too. They had just picked a new fifth-wheeler today and hadn't moved everything into it yet as their neighbor on the other side from Montana let them use their flatbed trailer to haul and store all the items from their old fifth-wheeler. I was invited over for a social and got to meet their other friends as they are here on a long term (month) basis. It's incredible that my reason for stopping here lined up with being put next to Shannon and Jeep, and we just happened to meet not at the site but some distance away. Ok, it's not that incredible, but after going back to my camper I went outside and met the couple on the other side of me. You got it, they are also from Mass. They are from western Mass and are staying here for a long stay as well. They are in the area helping an aunt. They are also familiar with the Westminster area too. He helped build houses and did some work in the area and used to live on Perl Hill Rd in Fitchburg. By the way, their new fifth-wheeler is beautiful! No kidding the living room has opposing pullouts giving a large living room. The kitchen has an island too. It is a house on wheels. My camper next yo it is so small, but I like it.